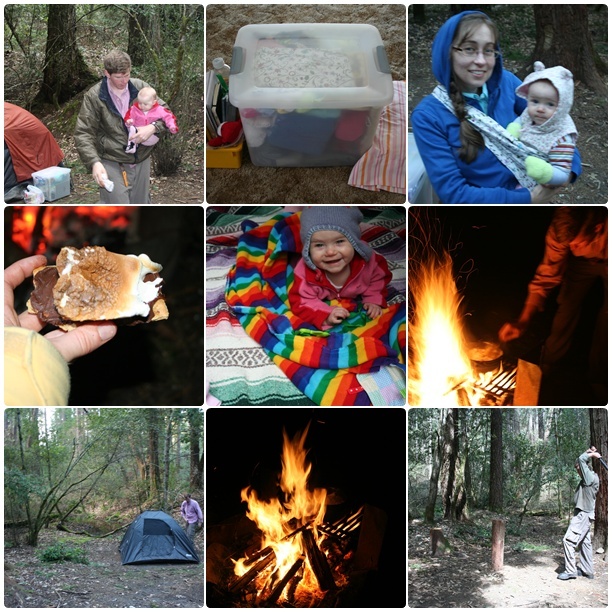 We have a goal to go camping every month between February and November this year. In April we went Bin Camping (meaning we packed everything in bins instead of backpacks and we camped close to the car instead of hiking to a campsite.) See that bin in the top-middle picture? I packed all three of us into that bin! I was so proud of myself! We did take one other bin - our camping gear bin - which held the tent, food, lantern, and other campsite stuff. Baby Two Flowers did pretty well. She stayed warm and didn't mind hanging out in the tent. Next time I think she is going to be crawling around the campsite, so I'm mentally preparing myself to let her get dirty and explore the ground! We had some awesome s'mores. It drives me crazy to have waited forever for a marshmallow to toast only to have my s'more crumble into a sticky mess at the first bite because the chocolate bar is never soft and the graham cracker can't handle the pressure. So we switched from chocolate bars to chocolate frosting. Way better. Creamy chocolate, sticky marshmallow. It just works better. We tried giant marshmallows this trip, but concluded that the regular large marshmallows are just fine and a better bite-size. There were some abandoned dogs hanging around the camp ground while we were there. We were very sad that someone had just left them there. They were sad and lonely and hungry, but we didn't have any dog food and didn't really want them hanging around our campsite. When we went for our hike in the morning we forgot to put our food bin in the tent or car and when we got back to camp we discovered that the dogs had raided the bin. They ate our leftover marshmallows and the whole can of chocolate frosting (which I was planning to eat on graham crackers when we got home). Very sad. And angry at the people who abandoned them. They also tried to eat a package of baby wipes. Our campsite was next to a creek, which is always lovely. Lost Boy chopped a lot of wood for the next campers. During our hike he put Baby Two Flowers on his shoulders and I had to hold his hand tight so I wouldn't fall off the trail because I couldn't stop looking at them. They were so cute and happy and wonderful. On the whole we had a good camping trip. It was very renewing. I even wrote in my writing notebook! We didn't go camping this month because I'm all worn out from traveling, and we won't be going next month because I'm having ear surgery the week we were going to go camping. Hopefully we'll get our July camping trip in! I love the picture of Lilli on the blankets! She looks like she's having fun. Yes! She seemed to have fun most of the time, except when she was strapped in her car seat by the fire (so she couldn't get into anything).